Whenever a donation is made, a donation receipt is necessary. It is a formal as well as a courteous gesture of expressing your thanks to the donating party for their sincere contribution to your attempt. It contains a confirmation receipt of the donation. The company or individual’s name and address are mentioned. The item or amount donated is also recorded in the Receipt Forms. At the end, the sender’s name and signature are added. This donation receipt is written in 2 slips. One side consists of the thank you note to the company for making a donation which is tax deductible. It consists of the company’s tax ID number. The name and address of the company along with the item or amount donated are mentioned. A donation made for charity can be thanked through a charitable donation receipt. At the outset, it consists of the details of the donor such as name, email, phone, and address. The thanking message can be written in 5 to 6 lines. At the end comes the receiver’s name and sign. You may also see Deposit Receipt Forms. Donation receipts can also be sent over an email. The email is addressed to the donor with a message expressing gratitude. 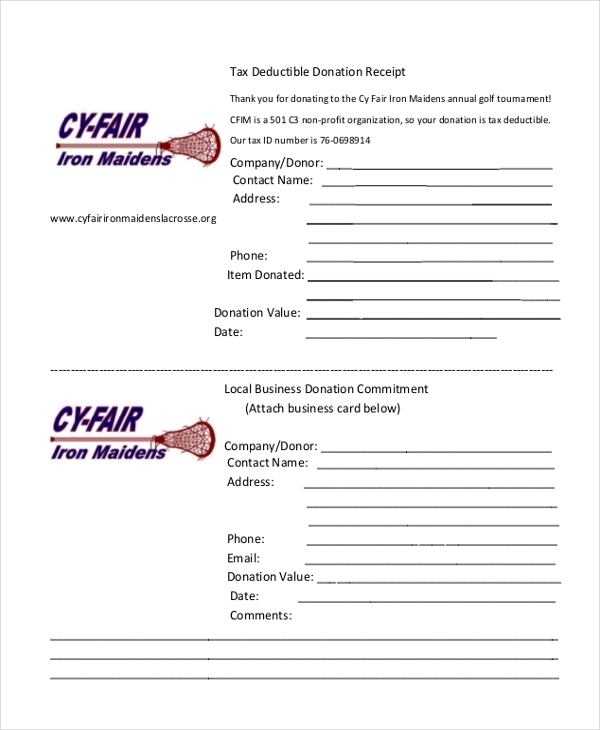 It consists of the details of the donations made and the ID number if any. 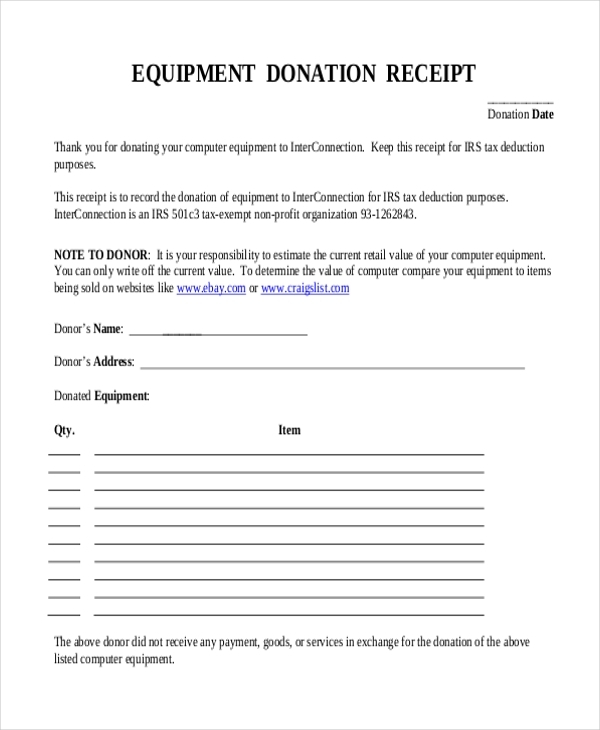 These donation receipts are written for the contribution of equipment to any institution or individual. It contains a record of the name and quantity of the items donated and is addressed to the donor with a thank you message. The receipt contains ID number for tax deduction process. You can also see Rent Receipt Forms. A silent auction consists of items that are donated by business firms for their representations. The donation receipt of this kind is different as it consists of the name of the donor as well as the advertiser. It also requests the donor to send a brochure for advertisement in the auction. 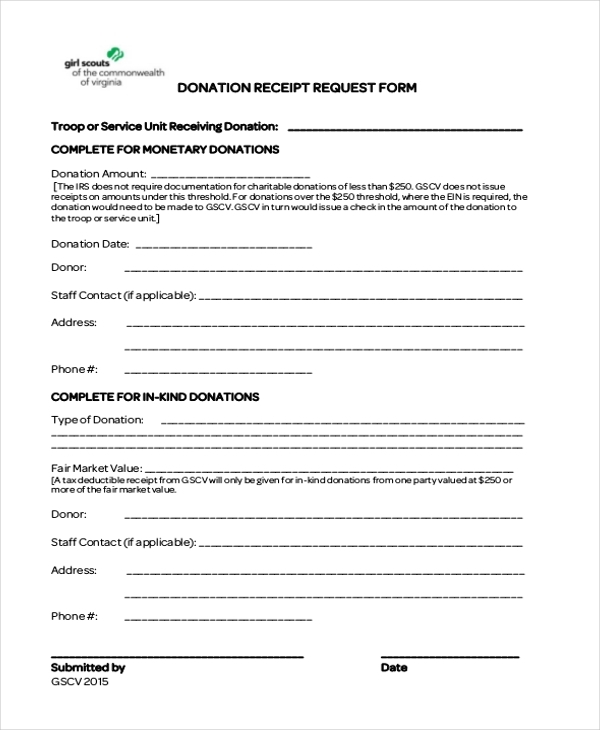 The donation receipt request form is a kind of cash receipt form consist of the details of the donor and the types of donation made. It is filled with two kinds – monetary donations and donations in kind. 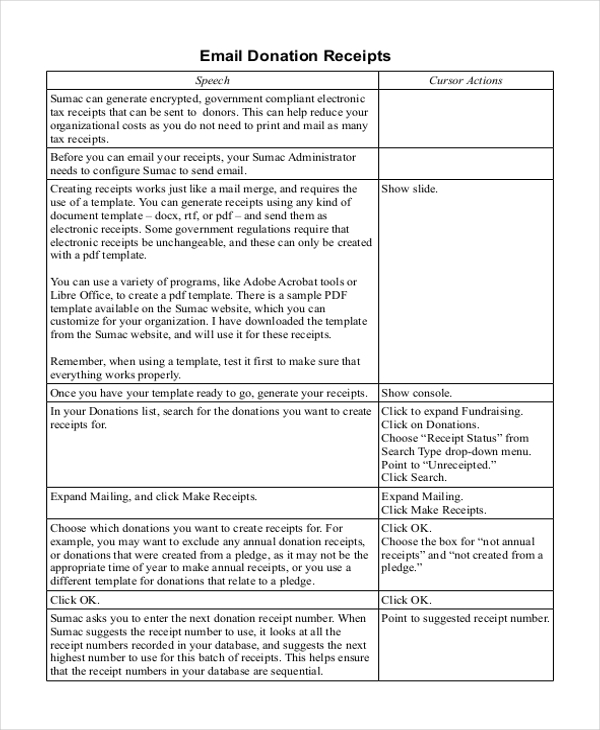 You can also see Donation Request Forms. 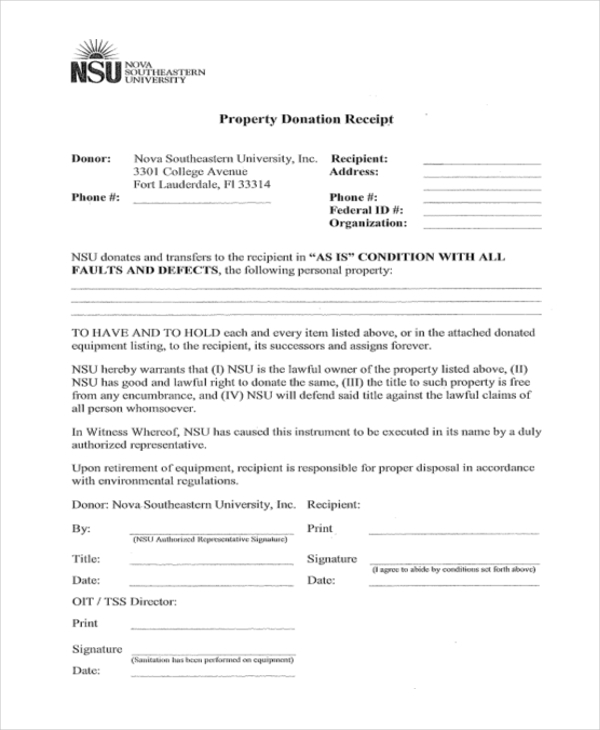 This donation receipt is made for thanking the donation of property to any institution. Since property matters are legal in nature, this receipt consists of the witness’ name and signature along with the donor’s and receiver’s signature. 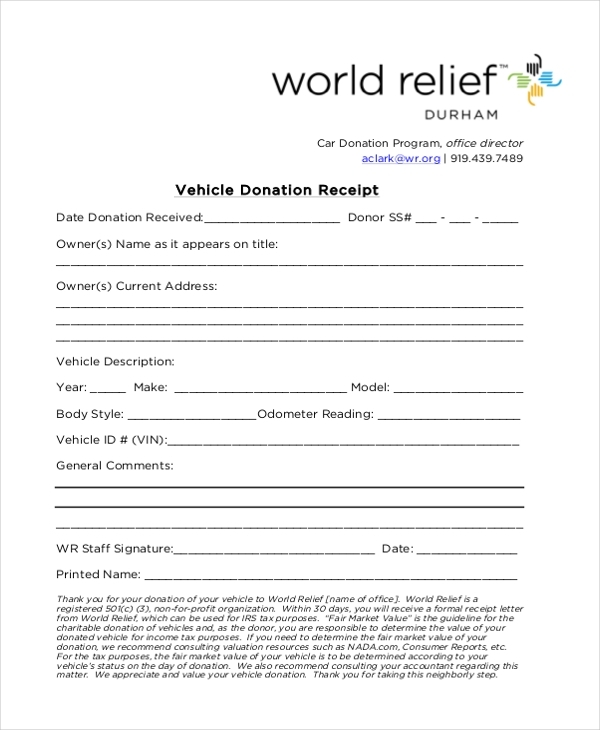 The donation of vehicles is recorded and thanked through this donation receipt. It mentions a description of the vehicle such as its model type, odometer reading, number, etc. It consists of the donor’s address and phone details. The audience targeted for these donation receipts are the institutions and individuals who receive donations. They make use of such receipts to confirm the donation received and present their gratitude. 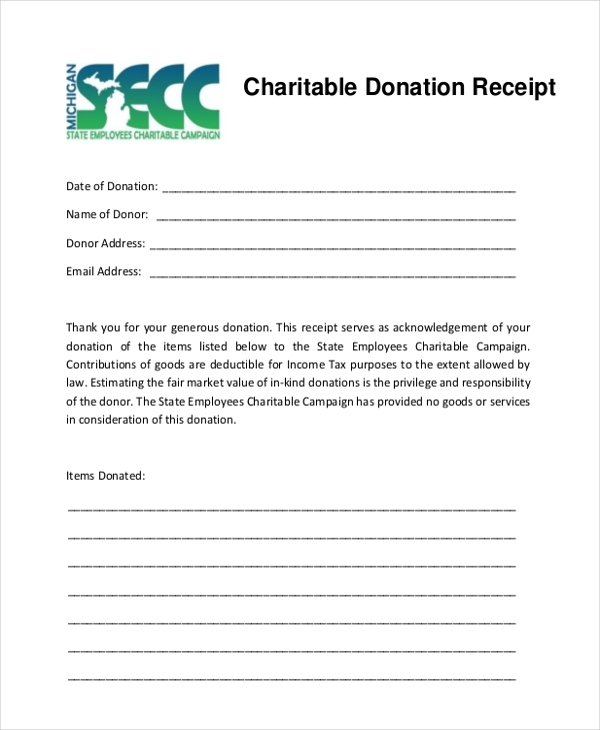 The vehicle, equipment or property donation receipts can be used by those who are opening a startup and have received assistance from any company or person through the donation. Some receipts are a means of business promotion as well. 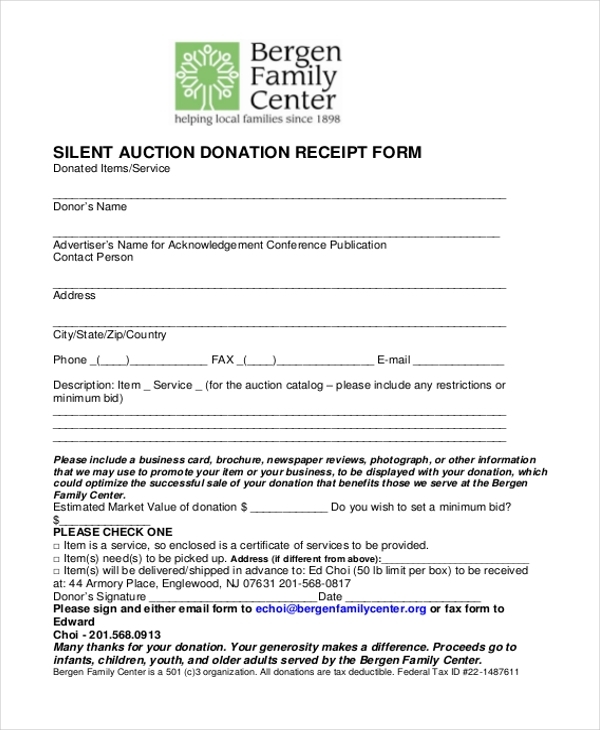 For example, silent auction donation receipts are purely promotional in basis. Charitable donation receipts are meant for NGOs and institutes running on charity for the reception of donation. You can also see Cash Receipt Forms. A donation receipt is beneficial for both the donor and the receiver. For the donor, it acts as a proof of the donation made by them. It is a record of their kind gesture made towards the receiving party. Cash receipt forms are also beneficial in the same way. For the receiver, it is beneficial for sending confirmation consent to the donor upon the reception of the item or amount. It also helps in expressing earnest thanks to the donor. You may also see Sales Receipt Forms. Donation receipts are an important part of the entire process of making a donation. It is a formal gesture of thanking as well as recording the evidence of the donation being made. It consists of the signature and details of the donor. The description of the product or amount donated is also mentioned. Thereby, it is a complete record of the donation.